Scientists are looking at household vinegar to provide protection for the coral reefs off the coast of Australia. There is evidence the health of the Great Barrier Reef is declining despite being one of the best-managed ecosystems in the world, and scientists hope they have found a way to help the situation. 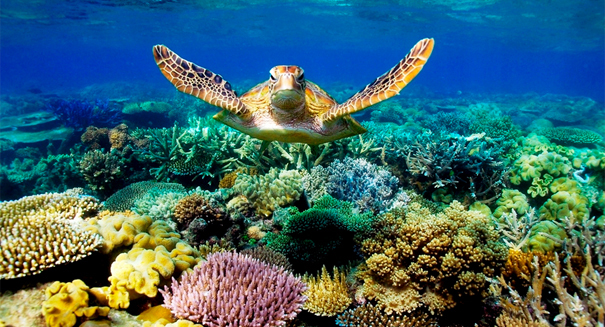 The Great Barrier Reef is located in the Coral Sea and is the largest reef system in the world, containing about 3,000 individual reefs and 900 islands, covering 133,000 square miles. According to an article on natureworldreport.com, the reef is under attack by a rising population of crown-of-thorns starfish. The reef-eating starfish has been identified as a menace and several programs are underway to eradicate them. The starfish, native to reefs in the Indo-Pacific region, climbs up on the coral polyps and covers them with its stomach. It then releases a digestive enzyme to turn the polyps into an liquid that can be absorbed. It is believed a single adult starfish can eat up to six square meters of reef in a year. It is estimated that there are between 4 and 12 million crown-of-thorns starfish on the Great Barrier Reef alone. Each female will produce about 65 million eggs in one breeding season. Research has shown that the coral cover on surveyed reefs has declined by about 50 per cent over the last 30-plus years and the starfish is being credited with half of that decline. Healthy coral reefs depend on coral-eating starfish to provide coral diversity by eating the faster growing corals and allowing slower growing corals to develop colonies. Researchers have found that the crown-of-thorns starfish can be killed by injecting common household vinegar into them. Vinegar is actually a fermentation of distilled alcohol, diluted to 5-to8-percent acetic acid in water. Teams of divers are currently injecting the starfish one at a time with ox-bile, a costly and inconvenient solution. The vinegar solution is cheaper and has the same result. Tests on fish that have eaten the vinegar-injected starfish have shown no ill-effects, but a larger trial will be undertaken before the vinegar solution is used out in the open ocean.